Place a box or a bench behind the seat of a cable pull-down machine. Kneel on the seat of the cable pull-down machine, facing the bench/box, and tightly secure your feet under the rollers. For reasons explained below, flex your hips a little and dorsally flex your ankles (i.e. point your toes up towards your shins). Cross your arms over your chest or keep them by your sides. Inhale as you allow your body to slowly and carefully fall forward, making sure to control the descent as much as possible with your hamstrings. Catch your body with your arms and lower your torso to the box/bench as if performing a push-up on your knees. Exhale as you push your body back up just enough until your hamstrings can take over and pull your body back up to a vertical position. Keep your hips slightly flexed throughout the exercise. This helps to keep your hamstrings more stretched, which allows them to work more efficiently. This is also why the bench of a lying hamstring curl machine is not straight. Keep your ankles dorsally flexed. This allows your gastrocnemius to make as much of a contribution as possible. If your ankles are not dorsally flexed, your gastrocnemius will be loose and therefore unable to make a decent contribution. The role of your arms in this exercise is only to prevent you from hitting your face on the box/bench. In other words, your hamstrings should do as much of the work as possible. Use your arms minimally. This exercise combines the inverse leg curl, an isolation and pulling exercise, with the push-up, a compound and pushing exercise. Because the push-up part will be minimized as much as possible, I categorized the exercise as an isolated pull. The height of the box/bench should not exceed the height of the seat of the lat pull-down machine. Use this exercise only when you do not have access to a leg curl machine. The inverse leg curl on lat pull-down machine can be made easier by holding on to the lat pull-down bar and adjusting the weight stack to allow you to descend slowly (see the second video). 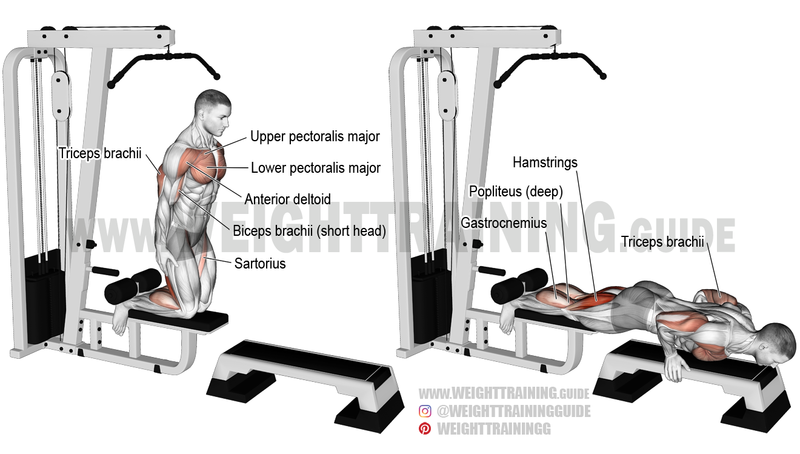 In this instance, you will not need a box/bench in front of you, and the exercise will be more properly known as the assisted inverse leg curl on lat pull-down machine. The inverse leg curl is also known as the bodyweight hamstring curl, the manual hamstring curl, and the Nordic hamstring curl. See also the inverse leg curl with legs anchored under a barbell.